Explore Pensacola! White sugar sand beaches, emerald water and the architectural feel of a tiny New Orleans. Add them together (plus restaurants that would send foodies to heaven), and you have Pensacola, Florida! Who knew? Pensacola is one of those towns where people make you feel like family, the arts and deep sea fishing combine with sandy feet and a laid-back vibe. You have to visit! Park your car downtown and walk! There isn’t heavy traffic but this city is made for strolling! The wrought iron details on the buildings and covered sidewalks beckon you past bakeries, restaurants and unique boutiques. Walk a couple of blocks and you arrive at the Yacht Club and the bayside benches. Spend an afternoon watching the sailboats glide by. Stop in at the restaurants! Foodies will also love McGuire’s Irish Pub and Brewery (600 East Gregory Street) where the steaks melt in your mouth and tradition requires you to sign a $1 bill to staple to the walls or ceiling. There is over $2 million dollars “hanging around” at McGuires! The traditional Irish music adds to the atmosphere (mcguiresirishpub.com)! Check out Restaurant Iron (22 North Palafox) at: Restaurant Iron .The Executive Chef, Alex McPhail, recently returned to his hometown from New Orleans. He previously worked at Commander’s Palace. He honed his culinary skills at Restaurant August and the Roosevelt Hotel while in New Orleans. The chef has created a dining experience that is totally unique. He serves Southern contemporary cuisine in a casual yet elegant atmosphere. This is only the beginning of the seafood, Cajun and Creole options in and near Pensacola! Peg Leg Pete’s (1010 Fort Pickens Road) is famous on-the-beach seafood (peglegpetes.com). Check out The Fish House (600 South Barracks Street), The Oar House (1000 South Pace Boulevard) and many more! In Pensacola and environs, every little restaurant serves up a meal you won’t forget. Don’t dress for dinner-Pensacola is relaxed and casual with shorts and flip-flops the attire of choice. No stop in Pensacola is complete without stopping in at Joe Patti’s Seafood (joepattis). 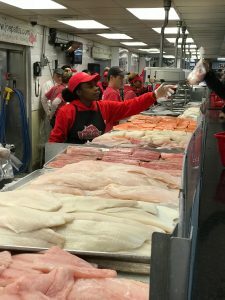 Even if you aren’t hungry, pay a visit to see the long counter of fresh catch filleted, weighed and wrapped to take home. This place is amazing. Joe himself sits on a throne-like chair and calls out order numbers. He is the king of fresh seafood in Pensacola. Take your camera because you’ll never see this much seafood in one place again. If you love aircraft and the history behind America’s might in the skies, drive to NSA. 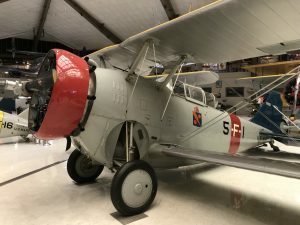 There is an aircraft museum and cafe there that will knock your socks off. Having lived in D.C., I can say that this display is bigger than at the Air & Space Museum. A veteran who helped land planes on aircraft carriers during WWII greeted us at that exhibit and explained how the deadly magic is performed. Get inside the flight simulator and try your hand at flying. You will feel the whoosh of the air burst from take-off in the auditorium dedicated to aircraft carriers. It is worth almost a day of your time to visit here. It is a fascinating education and an experience you won’t forget. The Gulf Islands National Seashore is bewitching. The seashore stretches for 160 miles along the northern coast of the Gulf of Mexico in Mississippi and Florida and includes barrier islands, maritime forests, historic forts, bayous and marine habitat.There are nearly 300 species of birds that have been identified here. See Osprey nest, watch Great Blue Herons, and see Black Skimmers mating and nesting in season. Sea Turtles also lay their eggs here. Dolphins and rays can be seen swimming near the shore. All are protected well by the eco-sensitive Gulf residents. Plan your hike at npplan.com. Stargaze here! Shed light pollution and go to the seashore (www.nature.nps.gov/air/lightscapes). If you love adventure, you can snorkel, kayak, boat, bike, camp and watch for the gopher tortoise or search for starfish. Rare and endangered species are also found here like the manatee, American crocodile, and the elusive Florida panther. Fishing is a religion along the Gulf. In the Perdido Key, Fort Pickens and Santa Rosa Areas of the national seashore boundary, the Gulf Intracoastal Waterway and at Naval Live Oaks the fishing is spectacular. Go spearfishing or deep sea fishing. Swordfish, mullet, crab, shrimp and undersea creatures make their homes in the nutrient-rich bayous and estuaries. Historic sites near Pensacola tell stories of their own (npshores.gov/). After Pensacola was selected to be a federal naval yard in the early 1800s, four forts were reinforced or built to protect it. For example, Fort Barrancas was originally built by the British Royal Navy as a log redoubt in 1763. The Spanish added to it in 1797 and the fort was again updated between 1839 and 1844. 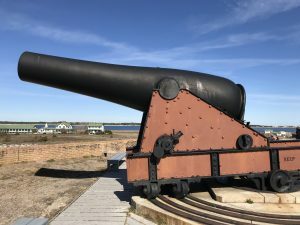 Of the four forts, Fort Pickens has the most famous history. Of course, millions will vouch that the reason to visit Pensacola is the beaches and the water! I thought photos were retouched showing perfect white sand and emerald water. NO! That is how it is here, people! I took a bit of sand from Pensacola Beach and compared it on my kitchen counter with sugar. Guess what? The sand was finer and whiter! Can you believe it? The reason is quartz. The beaches here are 99.4 % pure quartz crystal. Fishing piers call your name, sunsets are spectacular and night picnics cannot be beat at Pensacola Beach. Opal Beach is a part of the Gulf Islands National Seashore. Pensacola Beach has shops, eateries and the Pensacola Beach Pier that stretches into the Gulf of Mexico. Both are on the Pensacola Beach Eco-Trail, which allows for viewing of local wildlife. Here there are over 35 miles of designated trails to follow (floridahikes.com). Understand Why You Have to Go? Whew! This is just a peek at all there is to do in Pensacola. So put on your flip-flops, buy a tropical shirt and get here! Paradise is waiting for you! Help all of us by sharing your favorite places and things about Pensacola. Thank you!